It seems the walls have more than just ears (although it’s technically the painting with eyes…). captcha just had to say: beirrua Vol. do you think hes a writer? She just wants to be their friend! Couldn’t you just not need the book? It would have creepier if it frowned. You’ve really been Pushing the boundaries of the rating lately, I think crying blood would really be going too far. *cringe* It’s Luigi’s Mansion all over again. I’m suspecting this to be another Temple of Terror, except they actually are better at faking a dungeon. I’m just wary of him sending away other undead and suddenly things start acting wrong. It could be how Cattail Crossing gets its income. Or it could actually be cursed. 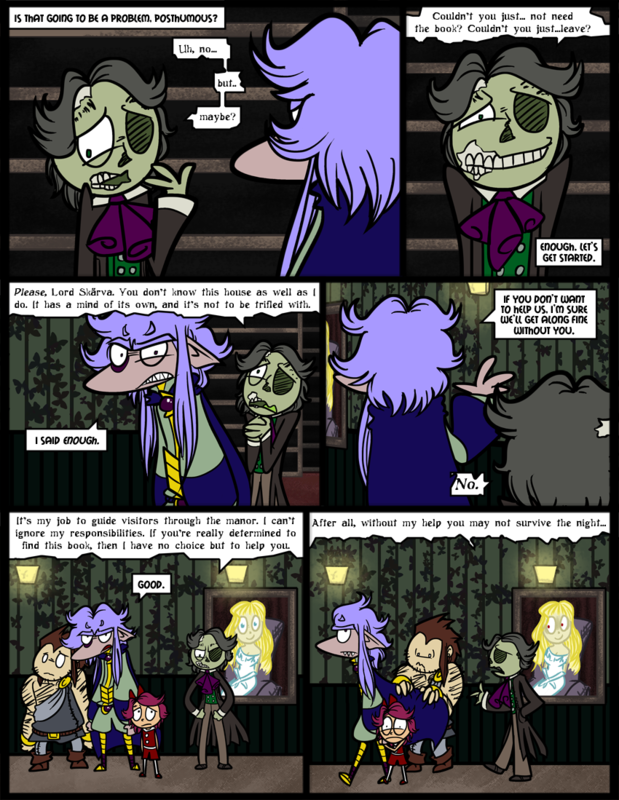 I actually don’t really know what’s going to happen in this house; either it’s going to be whimsical spooky parodies the whole time or things are going to get freaky… depends on where our creative juices take us in this arc The house IS definitely cursed though. The gods even like to punish buildings sometimes. I also wish we could have timed this arc closer to Halloween, but hopefully it won’t stretch out THAT long because jeez. Eh… To be honest I’ve gotten sick and tired of all the Holiday Events in comics and shows. If it happens to be spooky/cheerful/funny around the appropriate holiday, then whatever, but most tend to halt the story just for the event which may or may not be canon. I’m not saying you can’t, just that I don’t care whether it’s made for a holiday. Fair enough. Aside from a little bit of filler, we don’t plan on derailing the comic for holidays. Even though I love them! But Halloween is second-best holiday. I also like the idea of a Demon Day, something like an intense April Fool’s where everyone is supposed to prank each other. I dont know if youve ever read The Namw Of The Wind, but theres something similar. Basically, in the ‘main’ religion, their God, Tehlu, basically hunted down all the demons and killed them awesomely. But then, once a year, the priests sell/give away masks. mostly demon masks, but one Tehlu mask. Anyways, theres a billion people running around with masks that can do whatever mischiief they want, unless the dude with the Tehlu mask shows up or the townsfolk use some of the things demons fear, ie ‘Tehlus pure nmae’ or ‘the burn of cool iron’. Its like April fools, Christmas, and halloween all bundped up together. So the End’s holiday would probably be the day of the dead, but if it’s also the god of destruction, that could get to be a fairly dark festival. With so many ghosts being the product of curses, what would they do for that kind of holiday anyway? I once saw a guy in a French Maid outfit (with shoes but no hat). Picturing Post in that is so damn hilarious. Although him being like a maid does explain his crazy reactions. He’s tired of having to clean up all the time. Derk is touchin’ the cape! And then they all freak out. Y’know now that I see it, it’d be awesome if that painting was a gif and would change. Or maybe the eyes could follow your mouse around. That painting… It’s a nice painting. Posthumous second pannel has to be an avatar! It looks like it smells moldy in there. I’m sure it does. The zombies don’t smell too great themselves. Poor things. Me when someone asks to borrow something. Also, I had to shave the hair off of cartoon Allie Broshs’ head to draw Skarvas’ and Posthumous’ hair. Very scary. NOOOO! not this again! It wasn’t even supposed to be an x all the y! All they need is a lovable Pet who speaks with a lisps and a groovy 60 decorated van and they can go off and solve mysteries together.